A Russian Soyuz rocket rolls out to the launch pad at Baikonur Cosmodrome in Kazakhstan on July 20, 2015, two days ahead of the planned launch of three new crewmembers to the International Space Station. 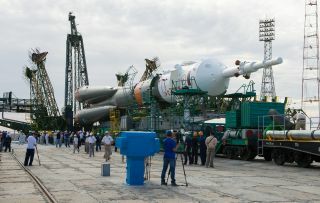 Three new crewmembers will finally launch toward the International Space Station today (July 22) after a two-month delay, and you can watch the liftoff live. NASA astronaut Kjell Lindgren, cosmonaut Oleg Kononenko and Japan's Kimiya Yui are scheduled to blast off aboard a Russian Soyuz spacecraft from Baikonur Cosmodrome in Kazakhstan at 5:02 p.m. EDT (2102 GMT; 3:02 a.m. Thursday local Kazakhstan time). You can watch the launch live on Space.com beginning at 4 p.m. EDT (2000 GMT), courtesy of NASA TV. Lindgren, Kononenko and Yui were originally supposed to head to the orbiting lab in late May, but their launch was pushed back by the investigation into the failure of Russia's robotic Progress 59 cargo mission. Progress 59 fell back to Earth in early May without reaching the space station, apparently doomed by a problem with the third stage of its Soyuz rocket. The Soyuz booster also lofts manned Soyuz spacecraft, so the Russian space agency, NASA and their partners wanted to make sure all was well with the rocket before letting crews ride atop it again. Kononenko is a spaceflight veteran, but today's launch will initiate the first trip to orbit for both Lindgren and Yui. If all goes according to plan, the trio will arrive at the space station about 6 hours after launch. They will join NASA astronaut Scott Kelly and cosmonauts Gennady Padalka and Mikhail Kornienko, who have had the orbiting lab to themselves since three former crewmembers returned to Earth on June 11. The departure of that trio — NASA astronaut Terry Virts, the European Space Agency's Samantha Cristoforetti and cosmonaut Anton Shkaplerov — was delayed by a month in the wake of the Progress 59 mishap, to minimize the amount of time the space station would be limited to three crewmembers. Kelly, Padalka and Kornienko arrived at the orbiting lab in late March. Padalka is serving the typical six-month stint, but Kelly and Kornienko are conducting the first-ever yearlong mission aboard the orbiting lab. The duo's experiences should help lay the foundation for crewed journeys to Mars, NASA officials have said.